Coffee connoisseurs know that the best coffee is the kind made from freshly ground beans. Whether it’s French press, drip coffee or espresso, brewing your drink immediately after grinding will preserve flavor and aroma. Once you’ve decided you want to step up your game in home brewed coffee, you have to decide what kind of grinder you need because there is a very wide range of these appliances and they can cost you anywhere from $20 to several hundreds. So, before we help you choose the best coffee grinder for the money and for your needs, let’s quickly touch on the different types of grinders available. You will find a wide range of coffee grinders on Amazon, but you if you want to know more about the best ones, read on! Many experts will immediately say that a burr grinder is the only way to go for quality coffee. While this may certainly be true for espresso, this kind of electric grinder does not come cheap. If you only want to drink drip or percolator coffee at home, then a good stainless steel blade grinder is perfectly fine. And if your preferred method is French press, the best results come from manual ceramic burr grinders. The biggest advantage of using an electric burr grinder comes when you want to change your brew up once in a while and just want to change the grind control setting to let the machine do the work for you. Burr grinders crush beans slowly, so no heat is generated and the essential oils are not destroyed. They do a good job of making very fine powder, which is what is needed to make espresso or even Turkish coffee. We have a very good list of grinders that are recommended for grinding for espresso. They also are more precise and consistent with the grind. If you’re after a burr grinder that’s best for French Press grinding, we have our list here. Blade grinders work at high speed to cut the beans and they generate heat in the process. This can be mitigated to a certain extent by freezing your beans until ready to use. They are much cheaper than burr and they generally do a good job for a medium size of grounds, which is what you need for most drip coffee machines. However, they can’t be programmed for high precision and your grounds may not be consistently uniform. Manual ceramic burr grinders are the cheapest grinders to buy but that doesn’t mean poor quality. They need you to manually crank it so grinding enough for more than a cup of coffee is tough, but they are best for the coarse ground French press coffee. They are also the easiest to clean and you can take it with you when you travel. Of course, you can also buy a coffee maker with a built in grinder if you want to do minimal work every morning. They are more expensive but offer the ultimate in convenience for coffee making, as you only have to fill the hopper with beans and select a few settings before you have a fresh pot of coffee. This attractive conical burr grinder comes in brushed stainless. The Capresso 565 has a fairly quiet motor in comparison to other electric grinders. It has four settings – extra fine, fine, medium, and coarse – with four levels for each of these settings to further refine your grind, for a total of 16 grind settings. It will take a little experimentation to find the optimal grind, but once you find the right setting, it does an excellent job of grinding the beans into consistently uniform grains of coffee. Most types of coffee grinding can be achieved, though the coarsest grind might not be suitable for French Press, as the granules are a bit fine for this purpose. The Capresso 565 is a heavy-duty, durable machine that holds up to a half-pound of coffee beans. You can choose between using an electronic timer to grind, or pressing the on button for pulse control. The upper grinder is removable for cleaning, however getting down into the base of the machine can sometimes prove difficult. Grounds sometimes get stuck in the chamber, which can result in older coffee mixing with fresher grinds. The plastic bin can build up static electricity during the grind (a problem common with most grinders), causing coffee to stick to the inside of the bin and some granules to fly out. Both these problems become non-existent if you use the dusting brush that comes with it. You also get 3 packets of grinder cleaner with this model on Amazon. The price is mid-range compared to other burr grinders, combining affordability and quality, so it is our top pick for best home burr grinder. This Baratza Virtuoso grinder is another conical burr grinder with a half-pound capacity. It is powered by a DC motor that allows the grinder to keep the beans cool while grinding. This feature allows you to retain the integrity of the beans’ flavor, as heat degrades the flavors of coffee. The DC motor also serves another function of a near-instant start up of the motor, allowing the beans to be ground consistently by the commercial-grade steel conical burr mechanism. The machine is designed with electric speed reducers that diminish noise and static electricity. With 40 settings, you can adjust for any grind from a French Press to an espresso grind. Experts praise this grinder as being able to grind uniformly at all settings, though the finest settings can be a bit too inconsistent. They say that the coarse settings turn out almost no dust, so this is a great grinder for French press coffee. Thus, the Virtuoso is recommended for all methods of brewing from French press to drip, but it’s not the best for espresso and certainly not for Turkish. Most experts confirm that Turkish grinding should be reserved for a manual, hand grinder. Packaged in eco-friendly recycled materials, the Virtuoso is a solid, heavy appliance that is durable and a reliable addition to any coffee enthusiasts’ kitchen. If you are looking for precision grinding, this Breville Smart Grinder Pro is the best of the bunch. With a large hopper capacity of one pound of beans, this Breville has a whopping 60 distinct grind settings, accessible by an easily adjustable knob. The upper burrs are also adjustable to fine-tune your grind to your personal taste. An electronic timer complete with an LED display allows you to time your grind in increments of 0.2 seconds. The hopper has a tight seal and a locking system so you can remove it for storage or cleaning. You can set this machine up to grind directly into a porta filter, paper or gold toned filter or any container. Of the burr grinders mentioned here, this Breville is rated the best in terms of finer grinds, and is the best burr grinder for espresso and even Turkish coffee. Coarser grinds are still not optimal, and you may not want to use it for French Press brewing. The grind chute can be challenging to clean since it is hard to reach the small crevices where grinds may get trapped, but overall the machine is the easiest to clean of the listed burr grinders. It comes in three color choices: cranberry red, black sesame, and silver. Comparable in price to the Baratza Virtuoso, the Breville BCG820BSSXL is on the higher end of the price range of coffee grinders. This small Krups electric blade grinder will take up little space on your kitchen counter, yet has a sizable grinding capacity of up to 12 cups of coffee. With a one button design, it is simple and quick to use with an inexpensive price tag. As with most blade grinders, you will sacrifice some precision and uniformity as it will produce some coffee dust in your grinding. Coarse grinding is nearly impossible, because the blades will pulverize some beans. You can also use this grinder for spices, herbs, grains and nuts. A small brush is required for cleaning around and under the blades, and you will likely still have some stubborn coffee dust sticking to these hard to reach areas. With the one-button push design, there are no pre-set grind settings and you will need to experiment through trial-and-error before finding the appropriate grind for your brew method. 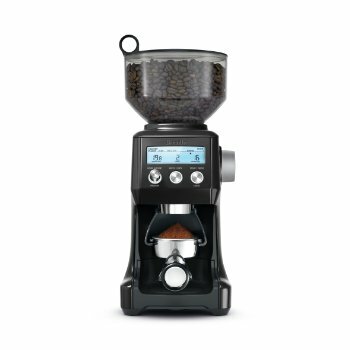 This machine is a bit loud but if you are looking for a no-frills inexpensive choice, this is the best grinder for drip and espresso brews at a low cost. Marketed as a coffee and spice grinder, the Secura electric grinder comes with removable stainless steel bowls, one for chopping and one for grinding. You simply attach the appropriate bowl and push down on the top of the unit to operate the unit. It costs a tad bit more than the Krups F203, but has some handy features for your money, including overheat protection to conserve the life of the motor and keep your grounds cool. The base has storage to wrap the cord when not in use and the inside chambers twist out to make cleaning a breeze. With the chopping function, this machine has dual functionality – you can use it to chop herbs, grind spices, and grind coffee. As with other blade grinders, the Secura grinder has no grind settings, just on and off, so it does best with fine to medium grinds. Your best choice for coarse grinds is the Kyocera ceramic hand grinder, recommended for French Press coffee connoisseurs. This ceramic manual burr coffee grinder helps to retain the coffee’s natural flavors. Ceramic is also hard and durable and never rusts as some metal grinders are prone to do. With an anti-slip base and comfortable crank-style handle, this manual grinder is small, quiet, and easy to clean with a mild dish detergent scrub and a a quick rinse under the sink. The removable glass container is dishwasher safe. Since there is no motor, there is no degradation of the beans through heat. The grinding portion fits on pint-size mason jars to store different coffee roasts and blends. Of course, this grinder is not electric, so it will take some experience finding the right grind. Manual grinding also takes a bit more time so it is not preferable if you are making large amounts of coffee, like whole pots of drip coffee on a daily basis. With a manual grinder, the grinds may not always be consistently uniform. At the end of the grinding process, some beans may pop upward and out of the grinder. You could buy the kit from Orphan Espresso to make the grind more consistent for coarse French press. The Kyocera coffee grinder’s small size and durability allows for easy travel – take it camping with a French Press and you’re all set for the morning brew. ← What is the Best Microwave Under $100 in 2017?